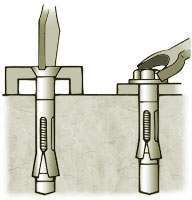 Using a hammer drill and carbide tipped drill bit, drill a hole the same diameter as the anchor diameter, and at least 1/2" to 1” deeper than the expected embedment. 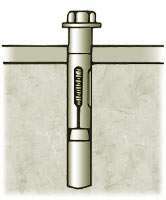 Set the nut flush with the top of the sleeve anchor. Insert the sleeve anchor through the fixture into the hole in the base material until the washer and nut are tight against the fixture. Turn the nut until finger tight.